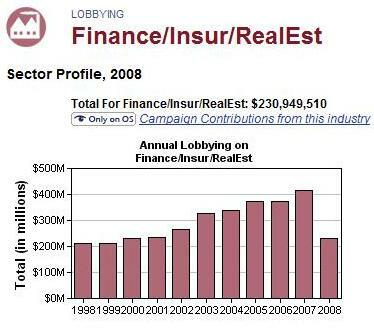 I am always amazed at the amount of lobbying that goes on in Washington, DC. Soft money, hard money, PAC contributions, it is all the same. I was wondering the other day how much of companies’ lobbying efforts played into the $700 billion American financial bailout that Congress passed last week and the bailouts the months prior. The Center for Responsive Politics provides a great resource for breaking down exactly how much money was given to politicians by whom. The center is a nonpartisan, independent, nonprofit research group that tracks money in U.S. politics and its effect on elections and public policy. The Center for Responsive Politics estimates that there are over 17,000 lobbyists currently working to try and persuade our politicians in one form or another. $2.8 billion was contributed to politicians last year, and we are already on track to surpass that number this year. The total amount of contributions has risen by an average of almost 8% per year. The 2008 list of Top 10 companies lobbying the government reads like the who’s who of the federal bailout. In 2008, General Motors gave $7,241,000 in political contributions. American International Group (AIG) gave $6,730,000. For General Motors, that’s not a bad return on investment. For the company’s $7.2 million dollar contribution, Congress and the President loaned the company $8.3 billion last month (their portion of a $25 billion loan package to the Big 3 Auto Makers). And, this is only for the first two quarters of 2008, the only data currently available. The numbers of course are larger in 2007 for these companies. Over the past ten years, bankrupt and bailed out companies such as Fannie Mae and Freddie Mac have given a total of $79.5 million and $94.8 million respectively. The United States Chamber of Commerce gave the most of any company in America over the last ten years, $398.2 million. Aren’t these three firms quasi-federal companies? Why do they need to lobby politicians for anything? Can this be the most efficient use of their budgets? No wonder Freddie and Fannie have been in trouble for so many years. According to the Center for Responsive Politics, the financial, insurance, and real estate sector (all lumped together) is responsible for the most giving, $3.2 billion, over the last ten years, or $230.9 million last year alone.